Dear Prosecutor, Public Defender, Ambassador and Jury Members of the International Buddhist Ethics Committee (IBEC) and Buddhist Tribunal on Human Rights (BTHR), regarding the Case 29-2017 against the "WORLD PEACE PRIZE AWARDING COUNCIL", on 21 August 2017, it is hereby recorded that the Ethics Committee's trial has concluded in order to analyze the violation of Buddhist Ethics and Human Rights committed by the accused. This Case has been carried out as a result of the "Case State Sangha Maha Nayaka Committee". After analyzing the presentation of the Case and the validation of evidence, it has proceeded with the vote of 5 members of the Jury, confirming that there were 1 vote of “Insanity” and 4 votes sentencing "WORLD PEACE PRIZE AWARDING COUNCIL" as "Responsible" for the serious crimes of Complicity with Crimes against Peace and Complicity with Violations of Buddhist Cultural Heritage. Not only has the "WORLD PEACE PRIZE AWARDING COUNCIL" ignored the claims of the Buddhist Tribunal on Human Rights to override the Peace Prize awarded to the President of the "State Sangha Maha Nayaka Committee", but it has also awarded a Peace Prize to a scammer who illegitimately usurps the Buddhist Cultural Heritage, deceiving lots of people with an alleged possession of spiritual status in order to sell paintings at huge cost. In this way, both Peace Prizes are spurious and illegal, because while one of the prizes provides an ethical endorsement on Bhaddanta Kumarabhivamsa, who has participated in international crimes against peace, on the other hand, Wan Ko Yee, who is a scammer using the alias of "H.H. Dorje Chang Buddha III", has also been awarded with another ethical endorsement. Thus, the International Buddhist Ethics Committee has implemented the jurisprudence used in the "Case UNESCO Association of Malaga", the "Case Yoga Beer", the "Case Norwegian Nobel Committee" and the "Case UNESCO", considering that both prizes are complicit in crimes against Peace and complicit of violation to the Buddhist Cultural Heritage. These acts demonstrate that the members of the "WORLD PEACE PRIZE AWARDING COUNCIL" are not practicing the Right and Adequate Peace (Samma-Santi). Although evidently they have given prizes to people who deserve this recognition in the past, the evidence is very clear regarding the illegality of the Peace Prizes given to Bhaddanta Kumarabhivamsa and Wan Ko Yee ("H.H. Dorje Chang Buddha III"). Both are disastrous awards, because they endorse criminal acts such as Genocide and Scam, and both situations being violations of International Law and also of Buddhist Law. Thus, the members of the "WORLD PEACE PRIZE AWARDING COUNCIL" have forgotten their supreme duty for the defense of peace, ethically endorsing criminals who use this recognition to continue perpetrating crimes. Therefore, the Maitriyana Community offers this Ethical Judgment for the "PEACE PRIZE AWARDING COUNCIL" as a way of teaching on the Righteous and Adequate Peace (Samma-Santi), so that this international organization quickly abandons its immoral behavior. If the "WORLD PEACE PRIZE AWARDING COUNCIL" is able to learn quickly from this Ethical Judgment and cancels the Peace Prizes given to Bhaddanta Kumarabhivamsa and Wan Ko Yee ("H.H. Dorje Chang Buddha III"), then the International Buddhist Ethics Committee will consider that a post-sentence reconciliation agreement has been reached, and then the charges will be annulled after having fulfilled the Purpose of Buddhist Law: the learning of good and rectification of bad behavior. Even, if this possible rectification or purification could occur in the future, the International Buddhist Ethics Committee could also offer unconditional ethical guidance for the election of future receivers of Peace Prizes. Because in 2003 the "WORLD PEACE PRIZE AWARDING COUNCIL" recognized Gandhi with a Peace Prize, something that even the Norwegian Nobel Committee failed to do, the International Buddhist Ethics Committee hopes that in the future this Vision about Adequate Peace (Samma-Santi) will be recovered, always recalling that it is better to honor the guides of the past than to honor the criminals of the present. Although Gandhi had ethical flaws in his personal life and in his vision of social justice in India, the Maitriyana acknowledges him as a great follower and practitioner of the Path of Peace (Santi-marga) created by Gautama, teaching that only the Power of ethical purification, Truth and Spiritual Love can triumph in the inner and outer world in the face of the conflicts of life. For this reason, the Free and Enlightened Beings (Arhats-Bodhisattvas) have the ability to self-sacrifice for the good of all beings. The Buddhist Law has the idea of creating a global community based on the essential values of world peace, social justice, advanced education and environmental health. This Way of life helps to safeguard what is most important in the history of humanity. However, it is required the commitment to act in accordance with the teachings of the great spiritual masters and social activists, such as Gautama and Gandhi, who have clearly defined the question of peace in order that it be never distorted. Although the capitalist civilization and the United Nations have certainly failed in the mission of creating an international community of peace, the Maitriyana confirms that real and efficient ethical leadership will never come from governments but rather will come from original cultural traditions such as Tribal Peoples and Spiritual Communities, who have contributed to a peaceful, just, wise and compassionate world for thousands of years. These Peoples and Communities mostly continue to exist independently of the authority in power, so they tend to be less corrupted. In effect, when Tribal Peoples and Spiritual Communities do not make an ethical critique of political powers, then the probabilities of corruption and benefit to a few are strengthened. Since the political leaders cannot meet the requirements of ethical leadership for humanity, then this vacant task must be filled by those who are empowered by Truth and Liberty, calling upon all nations to unite in a higher project of life that obliges to solve the problems of the world in the present time and simultaneously to have clear the goal of evolution in the horizon. Therefore, the Buddhist Law defends the idea of the human right to peace, but above all defends the supreme human right to evolution, whose historical driving force has been liberty, equality and fraternity. In conclusion, the International Buddhist Ethics Committee has the Purpose (Dharma) to guide the international community by means of True Peace, which implies a direct criticism of organizations that support a distorted vision of Peace. Therefore, it is established that the "WORLD PEACE PRIZE AWARDING COUNCIL" is violating the human right to peace by ethically endorsing or awarding individuals who commit crimes, especially by rewarding individuals who violate the Buddhist Law. Undoubtedly, the Peace Prizes should be aimed at individuals and organizations deserving such honor, and should never be aimed at those who commit crimes and attack Peace. World Peace is a Supreme Purpose (Dharma) that should never be associated with criminals; otherwise humanity would lose faith in a better world. Only by practicing the Path of True Peace, as practiced by many social activists in history, the organizations will be able to properly recognize those who are worthy of Peace Prizes. In this way, the Case on the "WORLD PEACE PRIZE AWARDING COUNCIL" is a great teaching for solidarity and truth to prevail, instead of injustice and deception that oppress the intrinsic dignity of human being. 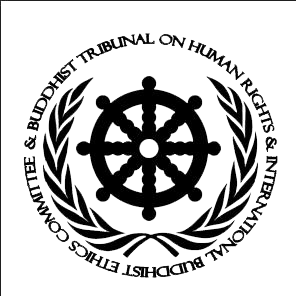 Following the Path of Master Gautama, who developed a Righteous and Adequate Path of Peace (Samma-santi-marga) at a global level, the International Buddhist Ethics Committee supervises national and international organizations to be righteous, just and ethical, never betraying the Commitment to World Peace, reason by which it has judged the "WORLD PEACE PRIZE AWARDING COUNCIL" as "Responsible" for Complicity with Crimes against Peace and Complicity with Violations of Buddhist Cultural Heritage.